Drill with Han-Le-Co Fire Co.
On Monday, Nov. 27, 2006 - Han-Le-Co Fire Dept. invited East Allen Twp. Fire Dept. and Hanover N.C. Fire Dept. to an old building for R.I.T. training. See photos. On Friday, Oct. 13, 2006, EAFD provided a morning and an afternoon session of Fire Prevention and Fun for about 34 boys and girls of St. John's Nursery School. Also in attendance were a number of parents. Below left Asst. Chief Ray Anthony demonstrates for the audience what a firefighter looks like wearing full gear. Chief Barry Frantz, left, looks on as Fire Marshal John McDevitt, center, explains to the group. Below right, there were also several outdoor demonstrations for the children. Everyone seemed to enjoy the day. It's also a day that the members of EAFD look forward to each year. 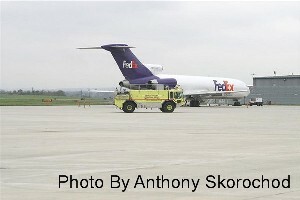 On Wednesday, Oct. 11, 2006 - Engine 4611 and Tanker 4631 went to Lehigh Valley International Airport (LVIA) for a Disaster/MCI Drill which lasted most of the day. Thanks to Anthony Skorochod for photos. On Monday, July 24 & 31 and Sunday, Aug. 6, 2006 - Bucks County Fire School taught a 16 hour state level aerial operation course. East Allen Township, Northampton and Bath Fire Companies took part in this class. See more photos. Congratulations to Hecktown Fire Company! On Saturday, Aug. 5, 2006 Hecktown Fire Company dedicated their new fire station. Our Ladder 4621 took 1st place for aerial apparatus and our Engine 4611 took 2nd place in its age class during apparatus judging. 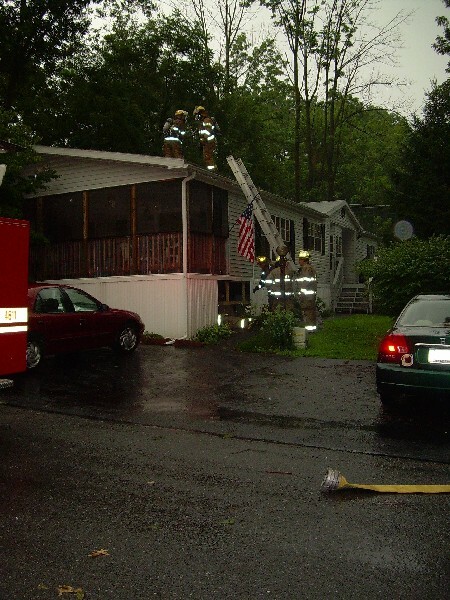 On Saturday, July 29, 2006 - At 0759 hours, EAFD was dispatched for a structure fire. Assist Chief 4652 went on scene at Keystone Cement and took command. Engine 4611 arrived and found smoke coming from a building with a coal conveyor. It seems likely that some hot coal ignited the rubber conveyor belt. As a precaution coal in the coal bunker that feeds the conveyor was removed to extinguish any hot spots. Two firefighters were briefly knocked down and partially covered with coal when a wave of coal and water exited the bunker that they had been applying water into. Due to the extreme heat and the need to frequently rotate crews, plus the uncertainty dealing with this type of fire, numerous mutual aid companies were summoned. The units cleared the scene within 8 hours. Photos by Don of Neffs Fire Co.
On Thursday, July 27, 2006 - 1342 hours. Fire 46 and Fire 45 were dispatched for dwelling fire on Nor-Bath Blvd. Deputy Chief 4653 took command. Ladder 4621 responded, determined to be malfunctioning stove Units cleared within 30 minutes. On Thursday, July 27, 2006 - 1848 hours. Fire 46 was dispatched for an automatic alarm at Ruch Road. Fire Police 4691 was first on scene and reported nothing showing. The building was entered and checked and no problems were found. On Thursday, July 27, 2006 - 1859 hours. Fire 46 and EMS 46 were dispatched for a dwelling fire at Greenbriar Village for a lightning strike. Engine 4611 and Ladder 4621 arrived, investigated and found minimal damage. Bath Station 40 assisted. The units cleared the scene within 1 hour 15 minutes. Photo by East Allen Township Volunteer Ambulance Corp.
On Thursday, July 27, 2006 - 1921 hours. Fire 46 and EMS 46 were dispatched for another dwelling fire on Colony Drive. Fire 45 assisted. There was a lightning strike outside near their home that hit a tree. The occupants reported smelling an odor of something burning in basement. Brush 4642 and Fire police 4691 were on scene, along with units from 45. The units cleared the scene within 45 minutes. On Friday, July 7, 2006 - 0706 hours. TEAM EMS arrived and advised no entrapment and that both parties were sitting on guide rail. Upon arrival of the first fire unit - Rescue 4641, Assist. Chief 4653 took command. Additional fire companies - Fire 45 (Allen Twp. ), Fire 40 (Bath) and Fire 33 (Han-Le-Co) were dispatched. There was also a debris field on the travel lanes. Fire police shut down Nor-Bath Blvd. between Airport Road and Mill Street. The debris was swept from the roadway. The vehicle was righted, removed and the roadway was opened. The units cleared the scene within 2 hours. On Monday, June 6 & 12, 2006 and Saturday, June 17, 2006 - Engine 4611, Ladder 4621, Tanker 4631, Rescue 4641 and Brush 4642 went to Lehigh Valley International Airport (LVIA) for a EVOC Training all day. Northampton County Fire School taught a 16 hour certification course. 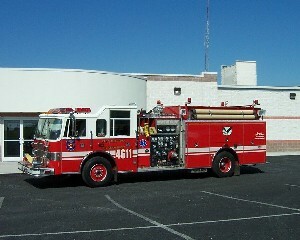 On Saturday, April 6, 2006 - Engine 4611 went to Northampton County Fire School for a live burn all day. We had 6 firefighters gradated from fire school. On Sunday, April 7, 2006 - Engine 4611 went to Hanover Township Northampton County for Pump Operations Class taught by Bob Davis of Northampton County Fire School. 10 of our firefighters took this pump class. On Wednesday, April 12, 2006 - 1024 hours. Upon arrival of first unit - Ladder 4621, Fire Marshal 4657 took command. Additional fire companies - Fire 45 (Allen Twp.) and Fire 33 (Han-Le-Co) were dispatched. Ladder 3331 (Han-Le-Co) was out of service. Ladder 231 (Catasauqua) was dispatched. Asst. Chief 4652 requested a R.I.T. team from Fire 42 (Northampton). Smoke was showing and all visible fire had been knocked down by the building occupants. The units cleared the scene within 1 hour 30 minutes. On Tuesday, March 15 - Josh Smith and Ryan Shelly placed third at a competition of firefighting skills at the State Fire Academy and won a BRONZE METAL. Josh Smith, an East Allen Township Jr. Firefighter and Ryan Shelly from Northampton Fire Department, compete as a team in contest of firefighting skills. This was a program provided by the Bethlehem-Northampton Area Vo-tech School. Written by Chief B. Frantz. On Tuesday, February 7, 2006 - At 1705 hours, Engine 4611, Tanker 4631 and Ladder 4621 were dispatched for a dumpster fire on Keystone Drive. Chief 4651 had Allen Twp. (Sta. 45) dispatched to assist and advised to stand-by at Station. Chief 4651 arrived and advised fully involved 30 yard dumpster near rear of building. Engine 4611 arrived and 1-1 3/4" hand line was used to attack the fire. The fire was knocked down quickly. Ladder 4621 arrived and an elevated master stream was used to penetrate the debris. Engine 4611, Tanker 4631 and Ladder 4621 cleared the scene within 1 hour 30 minutes after extensive overhaul. On Wednesday, February 1, 2006 - At 0009 hours, dispatched Fire 46, EMS 46 and EMS 17. Rescue 4641, Engine 4611, and Brush 4642 responded from Fire Station 46 for an MVA on Beth-Bath Pike. EMS 17 found vehicle in drivers side in ditch. EMS 17 reported to command that they had a patient entrapped. On arrival of Rescue 4641 confirmed entrapment. Crews from 4641 and 4611 assisted EMS with patient removal. 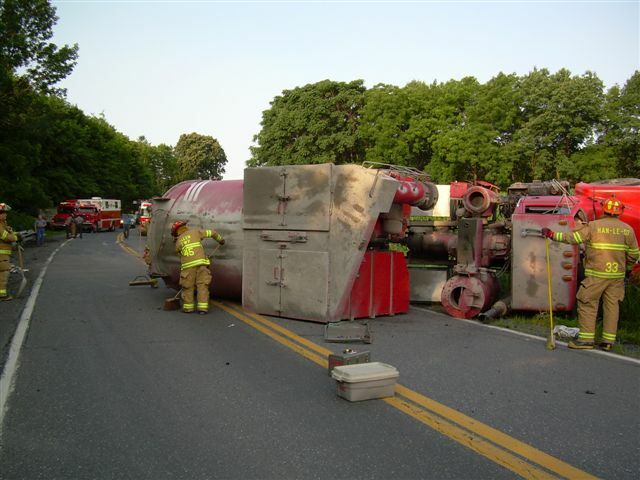 Brush 4642 and Fire Police provided traffic control, closing Beth-Bath Pike between Locust Road and Jacksonville Road. Rescue 4641, Engine 4611 and Brush 4642 cleared the scene within 1 hour. On Friday, January 27, 2006 - At 0127 hours, dispatched Engine 4611 and Ladder 4621 for smoke investigation on Locust Road. Smoke was coming from a chimney of a wood burning stove. House was checked for CO and with thermal imaging camera. There were no problems found. Engine 4611 and Ladder 4621 cleared the scene within 1 hour. On Saturday, January 21, 2006 - At 2011 hours, dispatched for MVA. Fire police 4692 went on scene at Airport Road with an MVA, vehicle into a pole with wires down. Upon arrival of Rescue 4641, Engine 4611, and Brush 4642, patient was self-extricated and EMS 46 was evaluating. Rescue 4641 crews provided fire suppression due to a small engine compartment fire. An ABC extinguisher was used for the fire suppression. 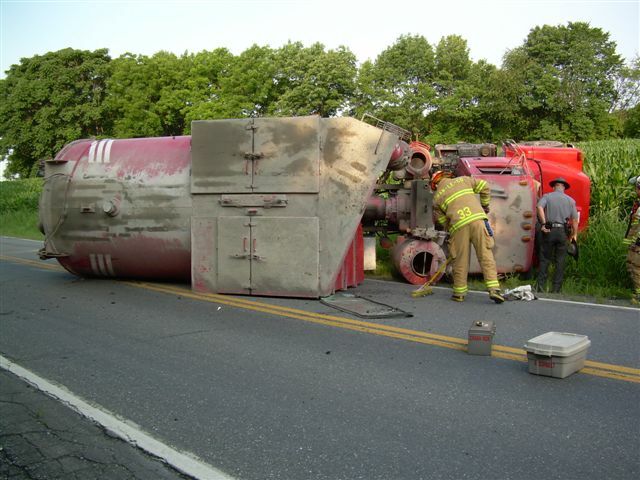 Also Fire police from Northampton County Station 15 and Lehigh County Station 33 assisted in closing the road. The units cleared the scene within 2 hours. On Tuesday, January 10, 2006 - At 1111 hours, dispatched Ladder 4621 on third alarm to assist Lehigh County Station 33 for a dwelling fire at Suzanne Way. Ladder 4621 cleared the scene within 1 hour 30 minutes.